I've finally finished my Brand NEW website! All my blog articles will be posted through this (very user friendly) website, and out to the usual social media feeds. Let me know if you like the new website. 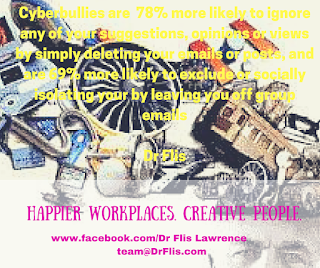 ...and, email me and let me what else I can develop to help you re-empower YOU in negative workplace situations. 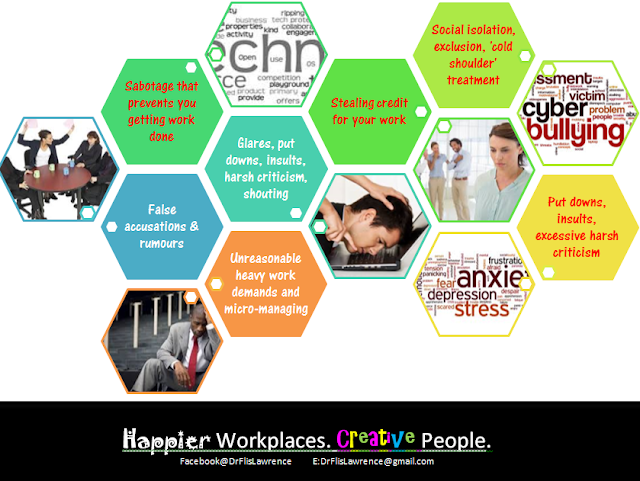 Become happier at work - after all, you spend enough time there! 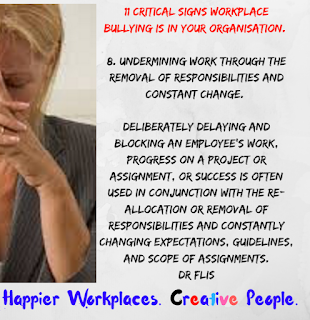 HR managers, supervisors and employers are often unable to effectively respond to workplace bullying because of a lack of training, and lack of confidence in workplace policies and practices. 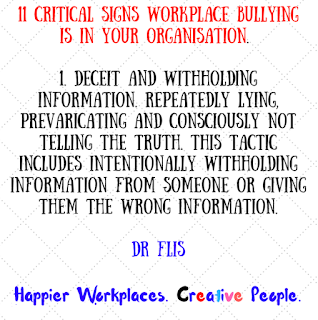 According to ACAS.org.uk, existing training for HR managers, supervisors and employers on how to effectively deal with, mitigate, prevent and intervene on workplace bullying matters is often intermittent and reliant on personal courage and the ability to negotiate often complex under-performance processes. 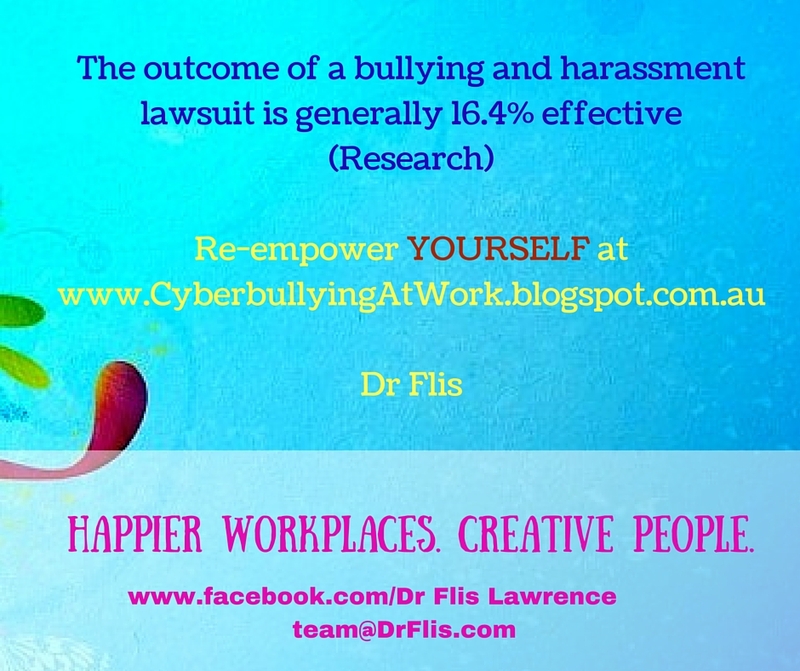 This lack of training and know-how is resulting in Australian employers forking out between $6 - $36 billion dollars in direct and associated costs of offline (and probably online) workplace bullying. 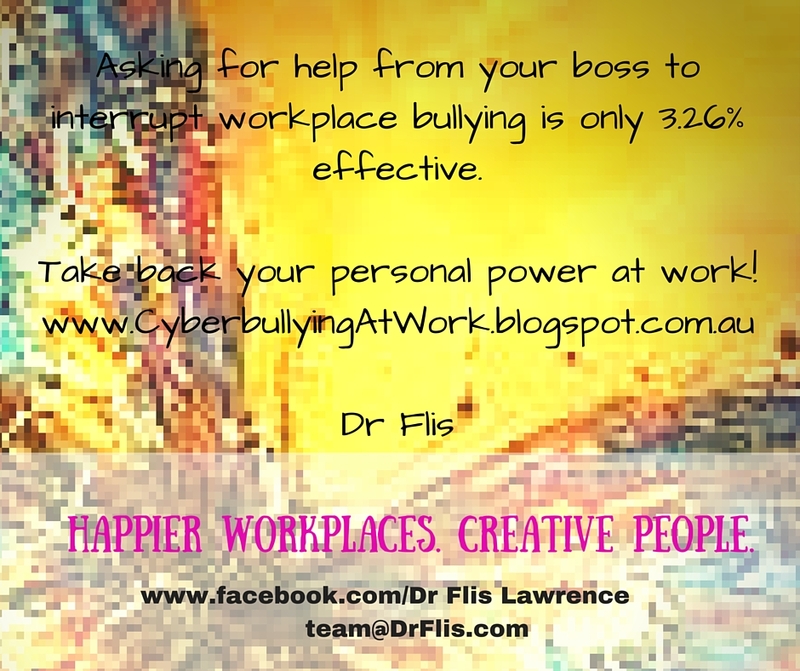 The Workplace Bullying Institute in the US reports an estimated 40% of employees leave directly due to workplace bullying. Obsolete workplace intervention and prevention measures have a tendency to bully the target, so organisations. 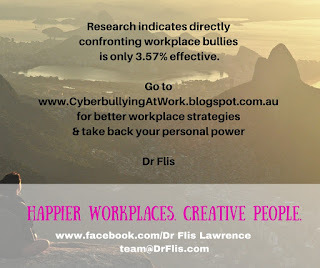 Organisational research has found bosses, supervisors, managers, employers and HR report are often afraid to confront workplace bullies, struggle with long-winded organisational processes, or regard the situation as a personal, rather than a work, matter. 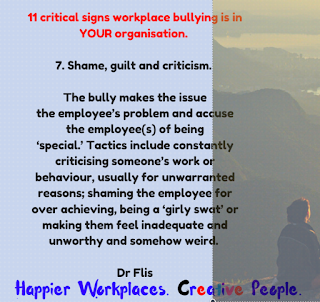 This article provides best practices for supervisors and HR on how to respond to allegations of workplace bullying, and all employees with 11 signs that workplace bullying is manifesting in your organisation or team/group. 1. HR and supervisors need to stay tuned into what’s going on with your team and be aware of the signs of bullying. 2. If you’re new to your role, seek a wise mentor and attend as many courses as you can regarding leadership, management, bullying and harassment. 3. 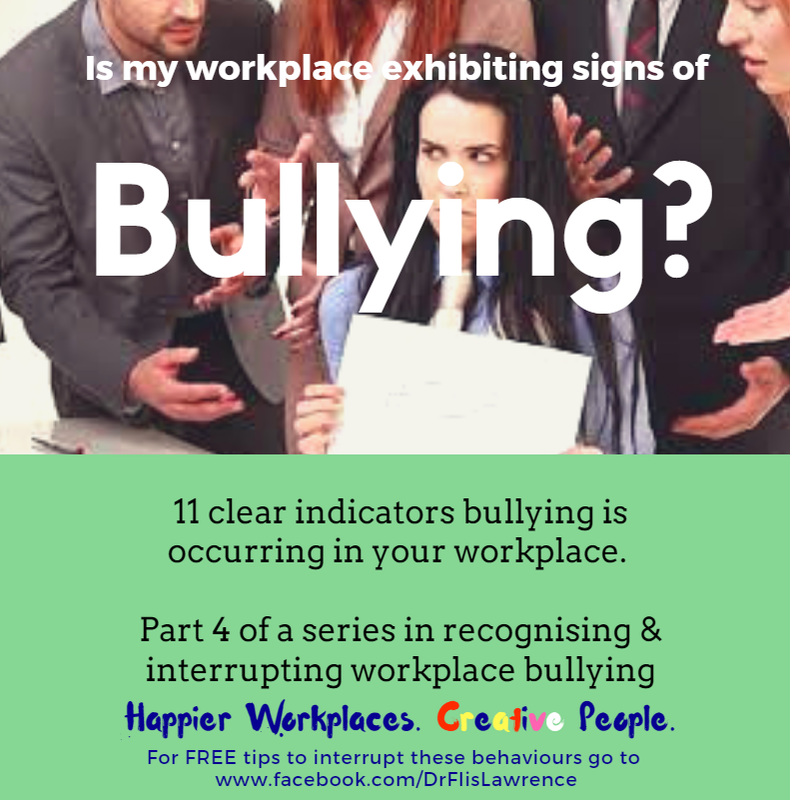 If you’re contacted by someone with an allegation indicative of workplace bullying, avoid the urge to minimise the situation with the employee, as ignoring a person’s concerns basically indicates you don’t value their perspective or believe them. 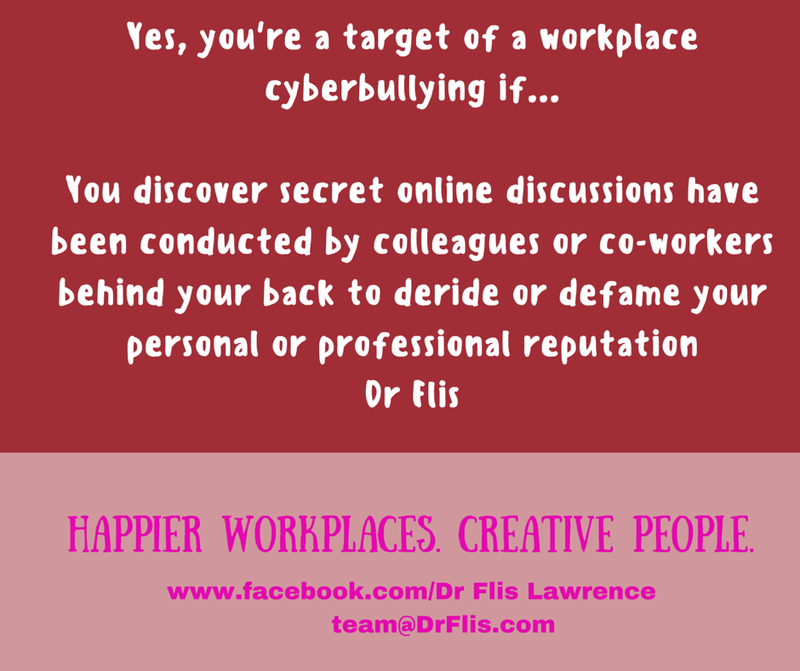 Try to avoid saying, ‘Work it out between yourselves.’ The last thing you want to do is victimise the target. 4. Acknowledge the problem and listen to both sides of the story. Provide both parties the ability to use you as a sounding board and an arbitrator of natural justice. It’s possible someone may be lying so you need to give the situation time to consider and review. 5. Consult the organisation’s workplace behaviour policy to educate yourself on investigation and termination procedures. 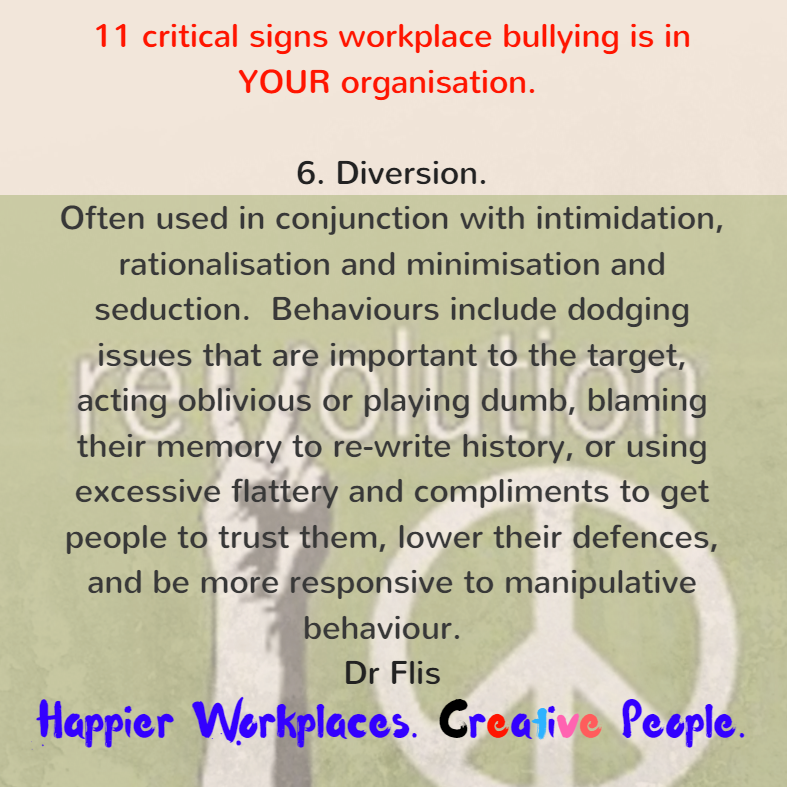 6.If you’re dealing with a long-term bully you may need to play hard ball. 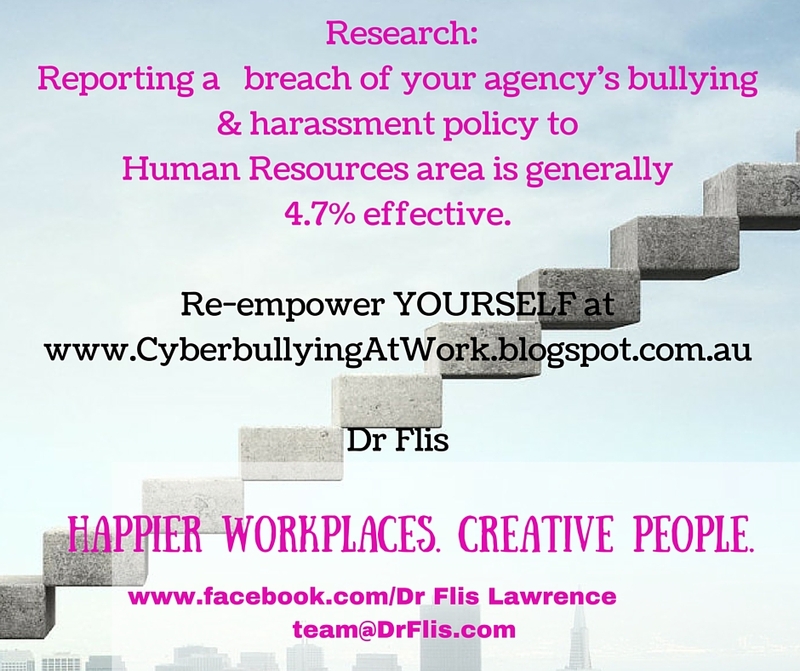 Use good recruitment processes to screen workplace bullies to avoid bringing in new bullies. An article by Dianne Peters can provide more detail and can be found here. 1. Deceit and withholding information. Repeatedly lying, prevaricating and consciously not telling the truth. This tactic includes intentionally withholding information from someone or giving them the wrong information. Interestingly, this strategy requires a very good memory so, once employees catch on, they can easily catch out the deceitful bully by making copious notes, using witnesses, email follow-ups and official voice recordings. Tactics include concealing the truth from others for the purposes of deception, obfuscate and create false hopes with follow through. 2. Intimidation and mood swings. 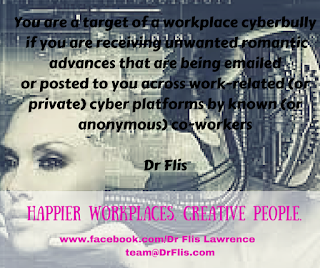 Overt or covert (veiled) threats around salary, bonuses, staff allocation, budget, allocation of programs etc. 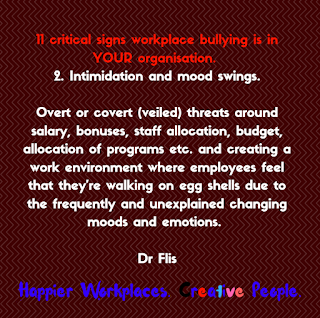 and creating a work environment where employees feel that they’re walking on egg shells due to the frequently and unexplained changing moods and emotions. Behaviours include over or covert intimidation through a combination of communication and physical behaviour. Once the employee(s) cotton on to this behaviour, all meetings should include a witness and be followed up with an email outlying the decisions made. 3. Ignoring or ‘cold shouldering’. Consciously ignoring, avoiding, or cold shouldering (socially excluding) an individual or group from another individual or group. 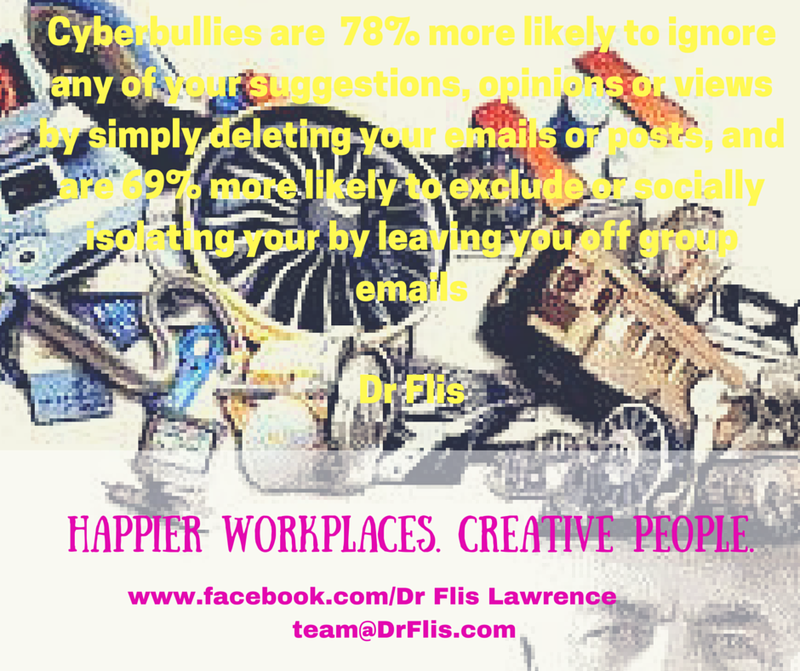 This behaviour can change from day to day, and those employees who are ignored one day may be the bully’s best mate the following day. It’s best to ignore this behaviour as infantile.Activities can include “forgetting” to invite someone to a meeting or walking into a room and being where everyone else except you is greeted. Intentionally excluding someone or making them feel socially, even physically, isolated or separate from a group. Excluding someone from decisions, conversations, and work-related events that may directly impact them. 4. Rationalisation and projection of blame. Excusing or defending behaviour or making excuses for acting in a particular manner because it suits that person to do so. 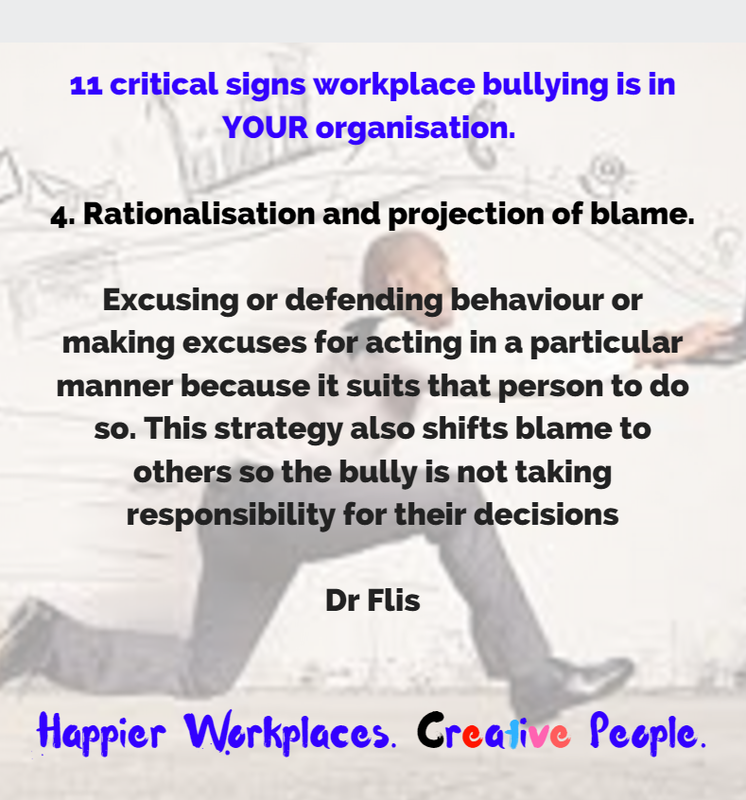 This strategy also shifts blame to others so the bully is not taking responsibility for their decisions.Curiously, employees to become aware of this behaviour quickly realise the bully is excusing their own conduct and castigating similar conduct exhibited by others. 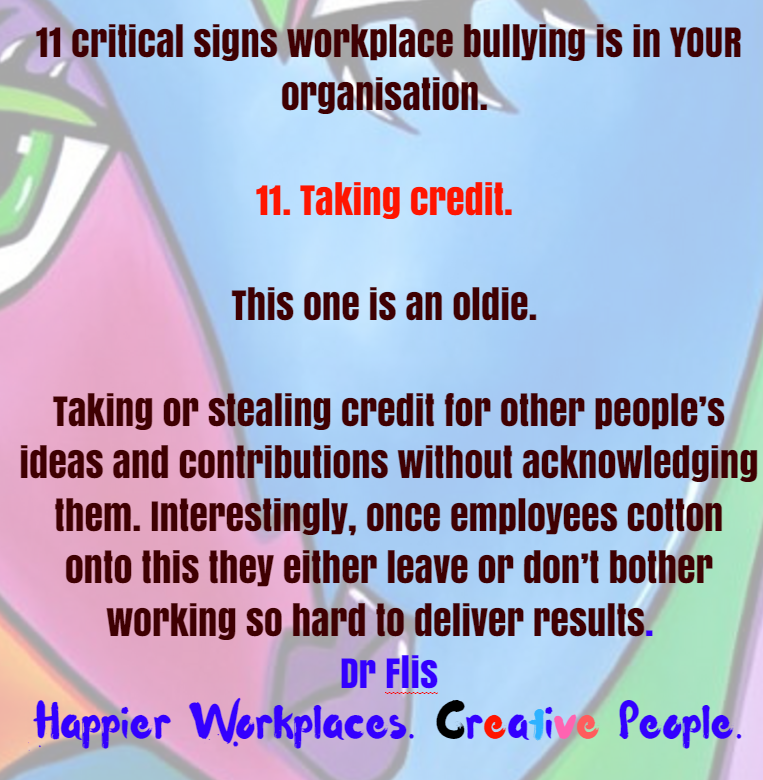 It doesn’t make any sense, however this sort of behaviour can act as a sign of workplace bullying behaviour. 5. Minimisation. Minimising, discounting, or failing to address someone’s legitimate concerns or feelings. 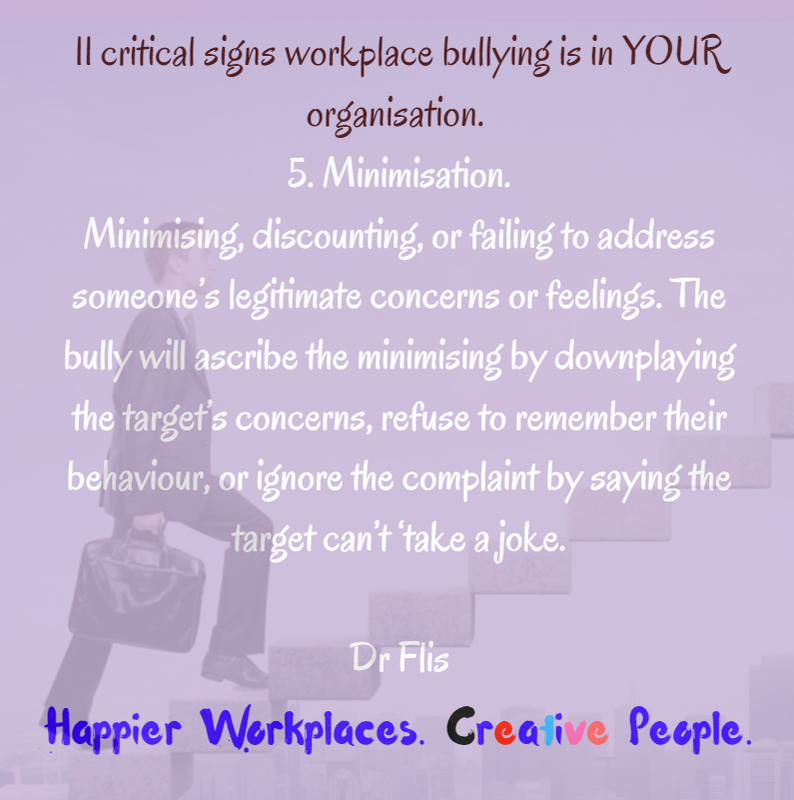 The bully will ascribe the minimising by downplaying the target’s concerns, refuse to remember their behaviour, or ignore the complaint by saying the target can’t ‘take a joke’. 6. Diversion. Often used in conjunction with intimidation, rationalisation and minimisation and seduction. Behaviours include dodging issues that are important to the target, acting oblivious or playing dumb, blaming their memory to re-write history, or using excessive flattery and compliments to get people to trust them, lower their defences, and be more responsive to manipulative behaviour. 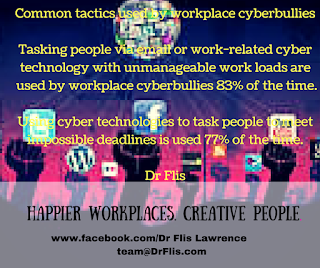 Tactics used include changing the subject to distract away from the issue, cancelling meetings, amending the amount of time in meetings so that the target has no capacity to defend themselves, and avoiding people by attending courses, travel etc. Once employees become aware of this tactic, they must support each other to stay on message during meetings, use meeting notes, personal notes, witnesses, meeting agendas and official voice recordings to re-focus the conversation. 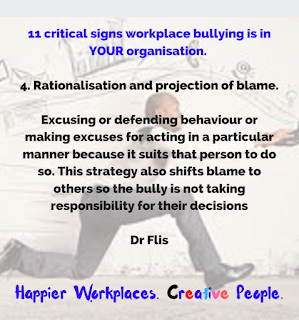 Prior to meeting the bully, review the organisational policy or guidelines that stipulate that this behaviour, decision is unacceptable. 8. Undermining work through the removal of responsibilities and constant change. Deliberately delaying and blocking an employee’s work, progress on a project or assignment, or success is often used in conjunction with the re-allocation or removal of responsibilities and constantly changing expectations, guidelines, and scope of assignments. 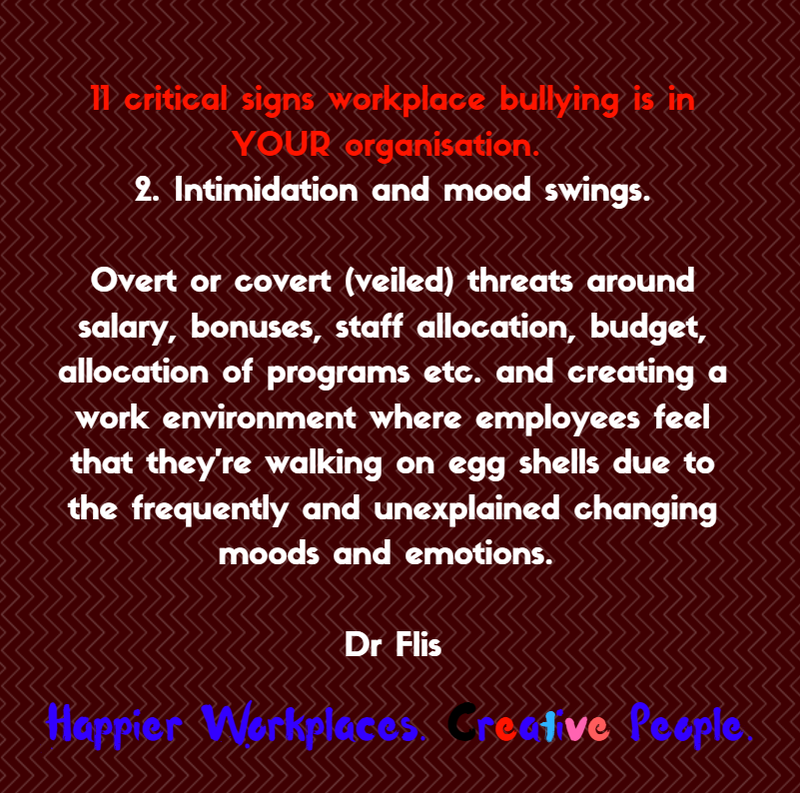 These tactics are used to undermine the employee’s power and influence, mainly because the employee is somehow perceived as a threat to the bully. This tactic makes employees feel underused and dis-respected. 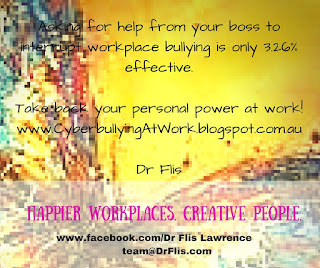 The bully generally provided back-handed compliments and support, and often rewards good behaviour with unfavourable duties and responsibilities. This behaviour is a weird, convoluted complement because if this is or has happened to you, then you’re a well liked, over achiever – I recommend you leave and find a position that wants (and needs) someone with your skills and experience. Tactics can include publicly questioning and undermining the employee’s decisions. This may include changing their role, responsibilities, program or project oversight, staff allocation, budget. Generally, anything that causes a reallocation or replacement of vital aspects of the employee’s job. This tactic is often conducted without cause or discussion, and tends to come ‘out of the blue.’ An employee may suddenly be ordered to retract decisions that were agreed in previous meetings, and which the bully now claims to not recall. 9. Pitting employees against each other. This is a great tactic for insecure bullies who rule by dividing and conquering. Another favourite is to create so much churn, change and pain that highly motivated and performing employees find they’re unable to deliver outcomes and leave. This leaves the bully with the ability to recruit people who don’t know anything about the organisation and are easily manipulated.Tactics used include deliberately vying other employees against one another to drive competition, create conflict, or establish winners and losers; encouraging employees to turn against one another. 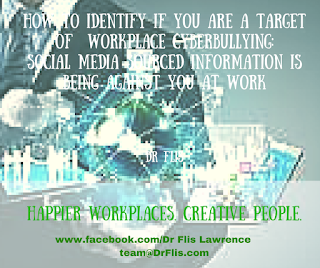 Usually, this tactic is used to undermine high performing employees or individuals who are highly respected and are a threat to the bully. While this tactic is an inverted complement, it’s very hard to diffuse and manage. I recommend reading my free eBook ’20 killer tactics to staying sane in toxic workplaces.’ – just log onto my blog front page here. 10. Setting impossible or changing work expectations. 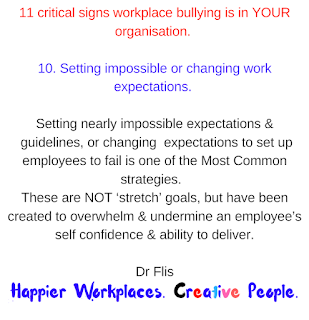 Setting nearly impossible expectations and work guidelines or changing those expectations to set up employees to fail is one of the most common strategies of workplace bullies. These goals are not ‘stretch’ goals, but have been created, and then amended, to overwhelm and undermine an employee’s self confidence. 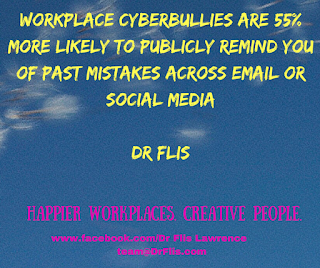 It also means a bully boss can sack employees who are consistently viewed as under-performing. If this is happening to you, immediately report the matter to HR (they may be unable to do anything, but the report will be logged). 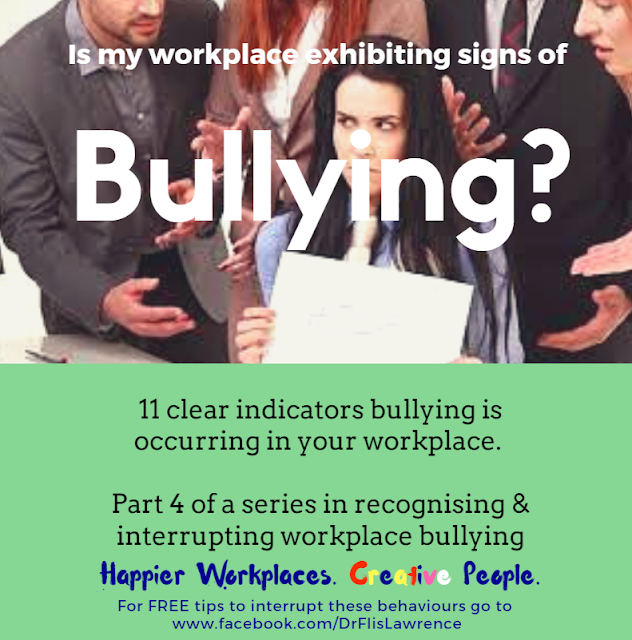 If this is a common workplace behaviour, HR may be able to help by organisation a staff survey to check the health of the workplace, and check the statistics around unexplained absenteeism, sick leave etc. to find out if this workplace is experiencing a problem. 11. Taking credit. This one is an oldie. Taking or stealing credit for other people’s ideas and contributions without acknowledging them. Interestingly, once employees cotton onto this they either leave or don’t bother working so hard to deliver results. In this day and age there are so many ways in which a message can be delivered that bullies who attempt to take credit more than once can find themselves of receiving some blunt responses. One way to manage this risk is for staff to strategically omit key details in the presentation or documentation which can't be explained without your input - this makes it obvious who has worked on the project etc. 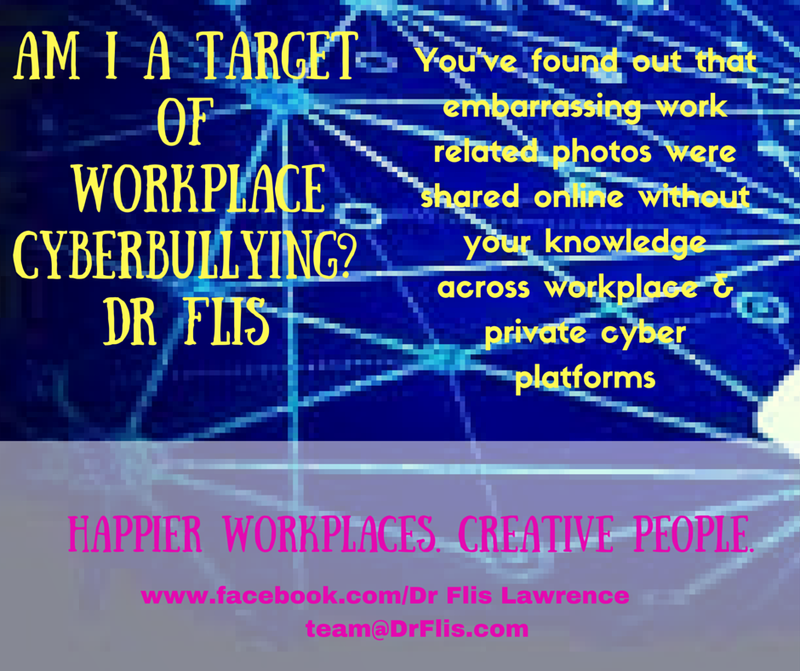 Dr Flis has a BA SSc and a PhD in organisational social psychology and works with individuals and organisations as a consultant, speaker and trainer. She uses her social science expertise to enhance interactions between organisations and the people who lead and work in them by fostering new insights for diagnosing organisational problems, and build new capabilities and culture. 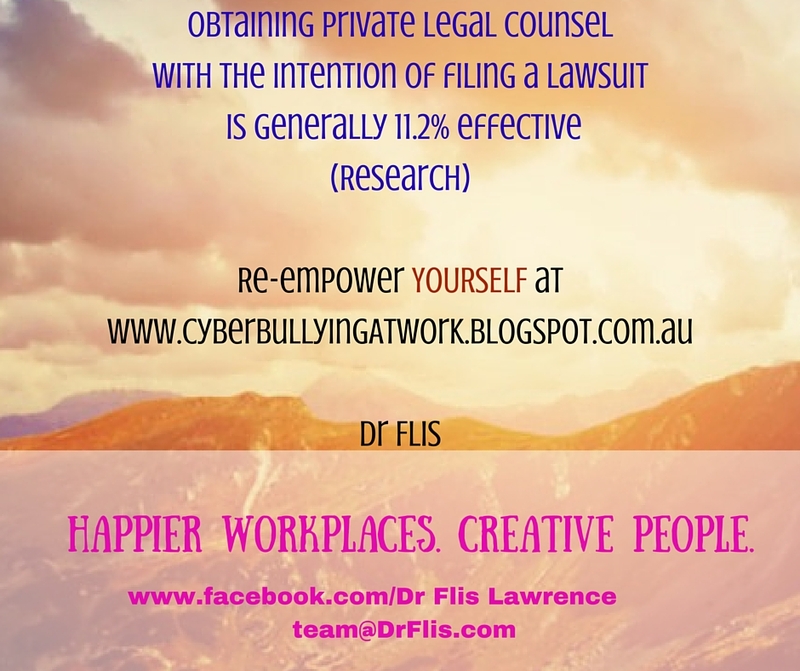 Contact Dr Flis at DrFlisLawrence@gmail.com, LinkedIn or follow Flis on her blog Twitter or Facebook. If you're working in a dysfunctional organisation tacitly or overtly permitting disrespectful, abusive workplace behaviours then you're at risk of bullying and cyberbullying. Studies have found that when a dichotomy is observed between outdated or ambiguous employee management policies and employees' actual, 'lived' workplace experience, then you are experiencing 'organisational deviance'. 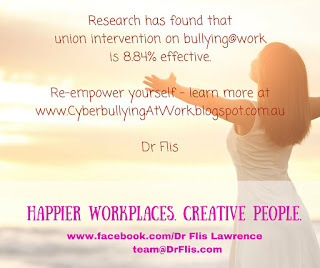 Contemporary organisational research of Australian workplaces matched levels ofbusive face-to-face behaviours with levels online workplace abuse (in some cases the online abuse exceeded the face-to-face bullying). Online communications can be conducted covertly and are often unsupervised. Targets experiencing online and offline work-related abuse quickly leave and seek employment elsewhere. The reason being, organisational cultures that tacitly support aggressive behaviours in order to 'deliver results' have no reason to change. 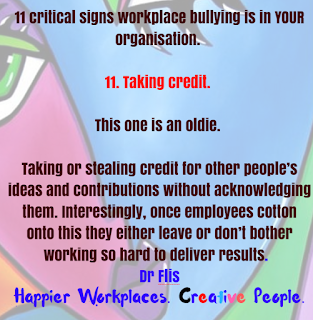 As previously discussed in previous articles (here and here), targets are often highly ethical and/or effective, and/or generally well liked and/or highly skilled (these qualities are a threat to organisational bullies). 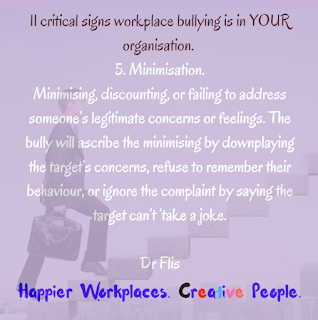 Once these targets realise they're being bullied (step 1) and stop blaming themselves for their co-workers' juvenile behaviour (step 2), and realise that the organisation is unable (or uninterested) in helping (step 3), they then tend to focus on their CV (step 4), and leave to find employment elsewhere (step 5). Unusually highly levels of staff churn either across the organisation or within one particular area or group (e.g., all your Band 1s and 2s in Corporate leave within a 6 - 12 month period) then you know something is deeply wrong. If this statistic is linked to low or no official reporting of bullying or whistleblower prevalence rates, then you know something is very wrong indeed (Caponecchia & Wyatt, 2011; White, 2000). Caponecchia, C., & Wyatt, A. (2011). 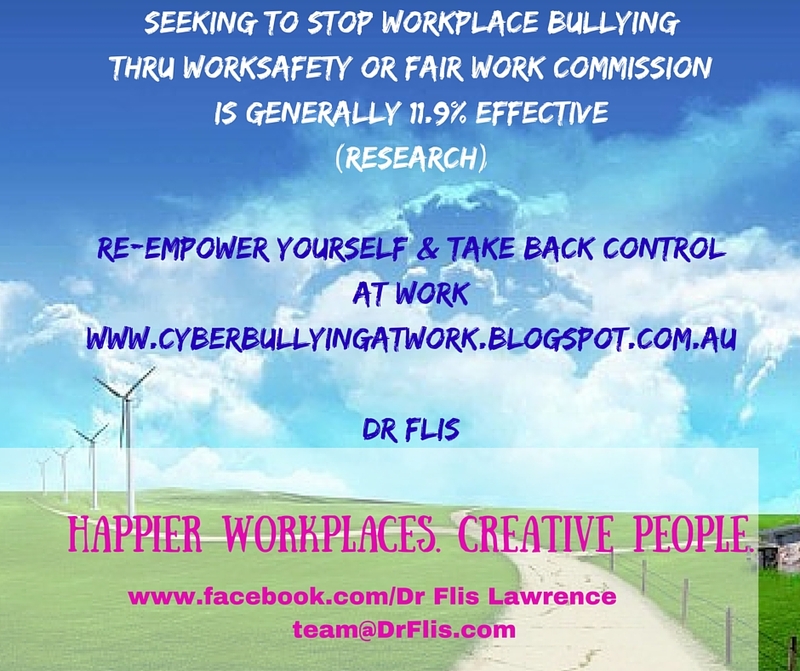 Preventing workplace bullying: An evidence-based guide for managers and employees. Sydney: Allen & Unwin. 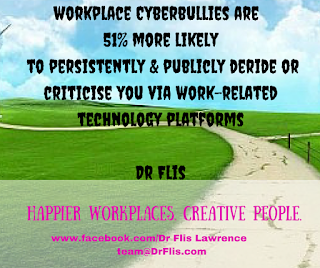 Workplace cyberbullying is bullying using technology. 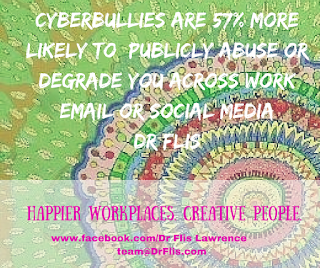 Qualitative studies have found targets view cyberbullying as more terrifying than face-to-face bullying. Because anonymous, abusive, professionally defamatory content, video or images can be rapidly broadcast and viralised any time and any where, across many different social media platforms. A target can wake up one morning and realise their professional reputation is in tatters, and never know why. It also means the perpetrator(s) could be working next to you as your supervisor, co-worker, a junior staff member, or a client. They're just sitting and watching you react. You just never know. Perpetrators now have the capacity to use personal and work-related social media websites and communication technologies to hound you. 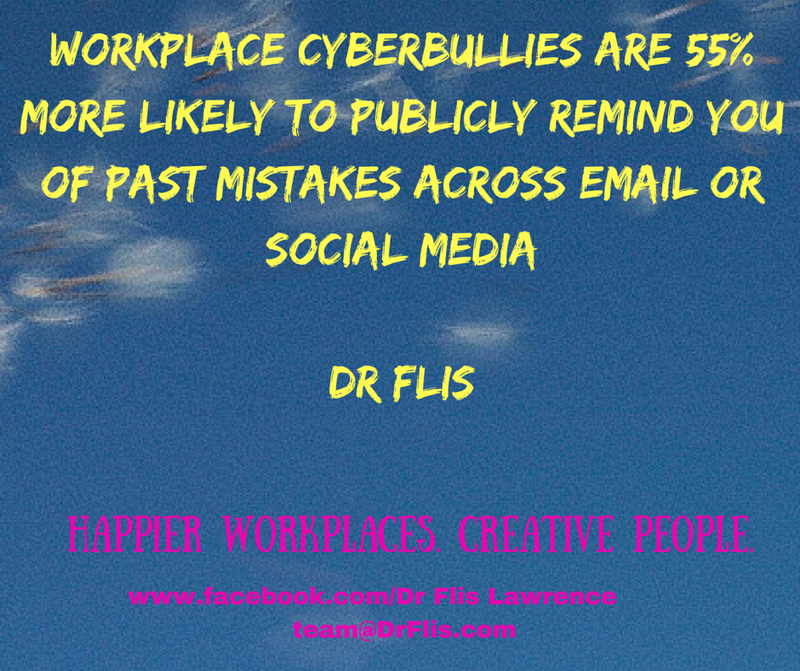 Taking a holiday, or changing workplaces, to get away from the behaviour is almost impossible when derogatory (and anonymous) posts keep landing in your personal Facebook page. 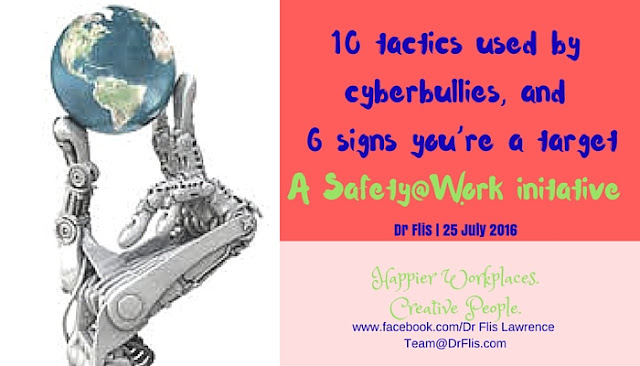 Some research: A 2013 study revealed cyberbullying is much more likely to escalate face-to-face workplace confrontations, where over half the study respondents said they'd front up to the workplace cyberbully. One in 10 study respondents said they’d probably respond in kind to the online perpetrators through similar cyber technologies. Is this something we really want to deal with in our workplaces? 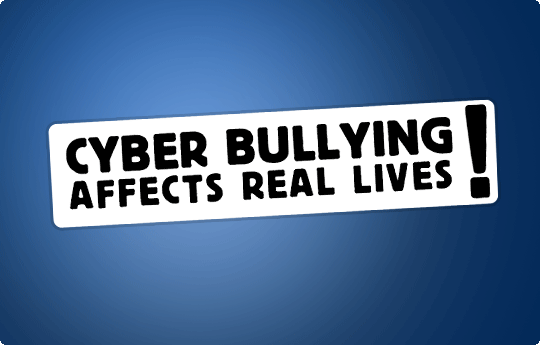 Can I protect myself from cyberbullying? I've written in detail about some tactics to use to protect yourself and interrupt the online behaviour. 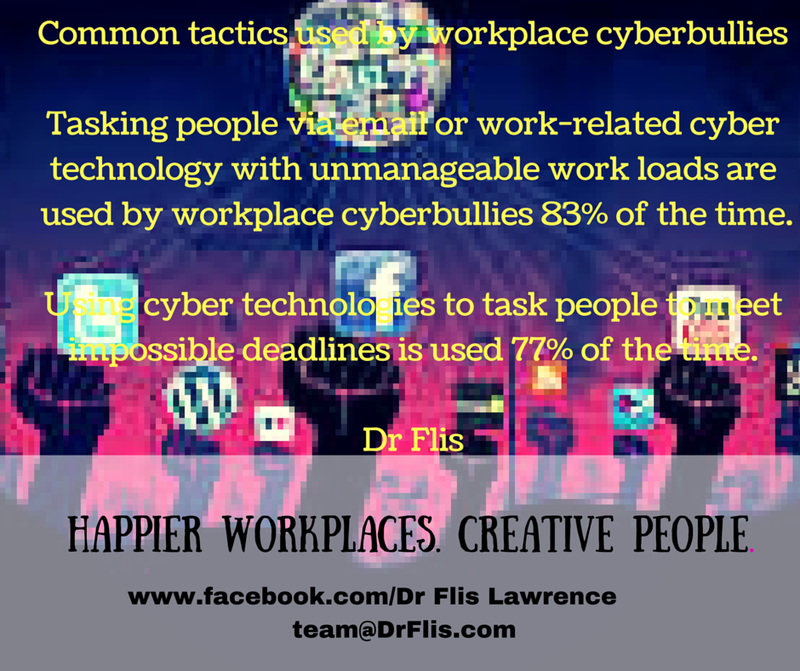 Strategies to help you interrupt or stop workplace cyberbullying, read ‘How to deal with workplace cyberbullying’ and ‘Online & offline workplace bullying can affect anyone’. Also, download my free eBook '20 killer tactics to staying sane in toxic workplaces’, which you can access through my blog. 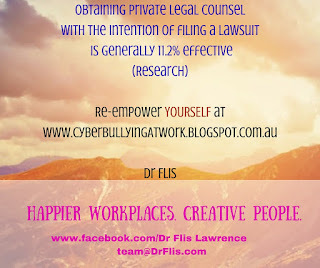 In brief, to regain your privacy I believe targets must increase the protections around their private online information, report the threatening online content to their local police, their boss, workplace HR and ICT area(s), AND the administrators of the social media platform being abused. Consider seeking private legal advice. You could also switch everything off and think about changing accounts. Think hard about this as this strategy isolates you, which is exactly what the cyberbully wants, and doesn’t always work. .
Study participants in the first academic Australian research of the view of employees working in government organisations, three quarters of those survey reported suffering or observing person-related bullying (online slander, social isolation and insinuation about people’s mental health) or task-related cyberbullying (micro-management, inconsistent allotment or incompatible distribution of tasks, persistent criticism of a person and their work). 1. Tasked with unmanageable work loads - used 83% of the time. 2. Tasked with impossible deadlines - used 77% of the time. 3. Tasked with work below competency level – used 63% of the time. 4. Tasks removed or replaced - 65%. 5. Excessive monitoring of tasks - 53%. 6. Your opinions or views ignored - used 78% of the time. 7. Ignored or excluded - used 69% of the time. 8. Target of spontaneous anger - 57%. 10. Persistent criticism - 51%. 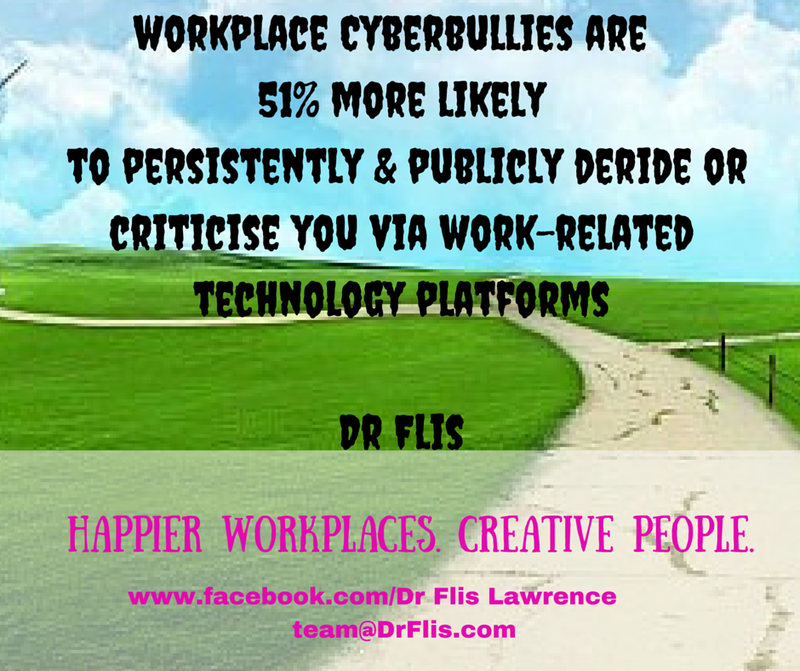 Effectiveness of existing workplace measures to resolve cyberbullying. 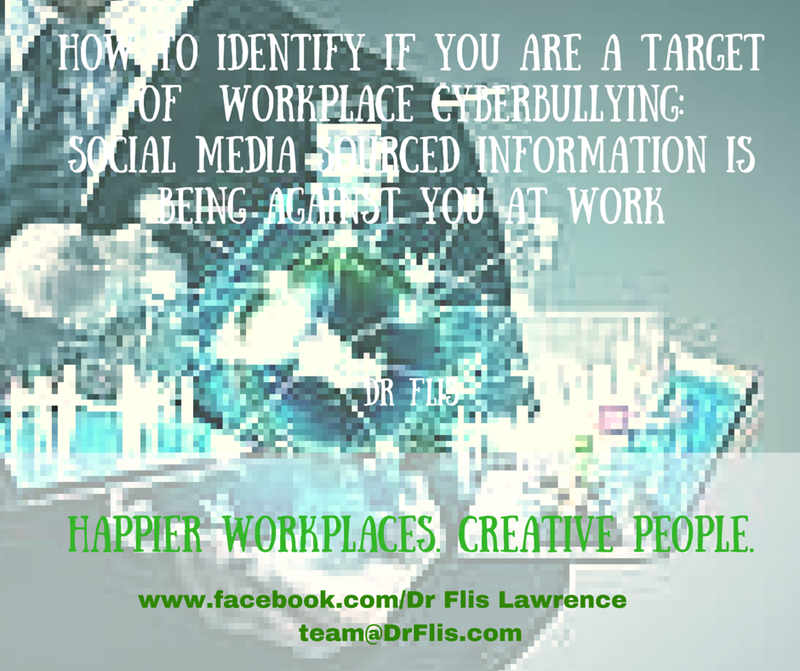 To my knowledge, not a huge amount of research has been done to satisfy this question in relation to cyberbullying at work. In thinking about it, the three Australian studies I conducted in my research at QUT may actually be the first to have asked this question in relation to online bullying (happy to be advised). 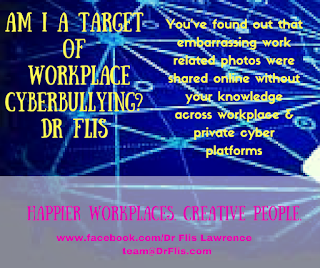 To cut to the chase, my research found that over half (56.2%) of the participants in study 3 (the qualitative survey) reported existing organisational measures (including culture and governance processes) as ineffective in dealing with workplace cyberbullying. 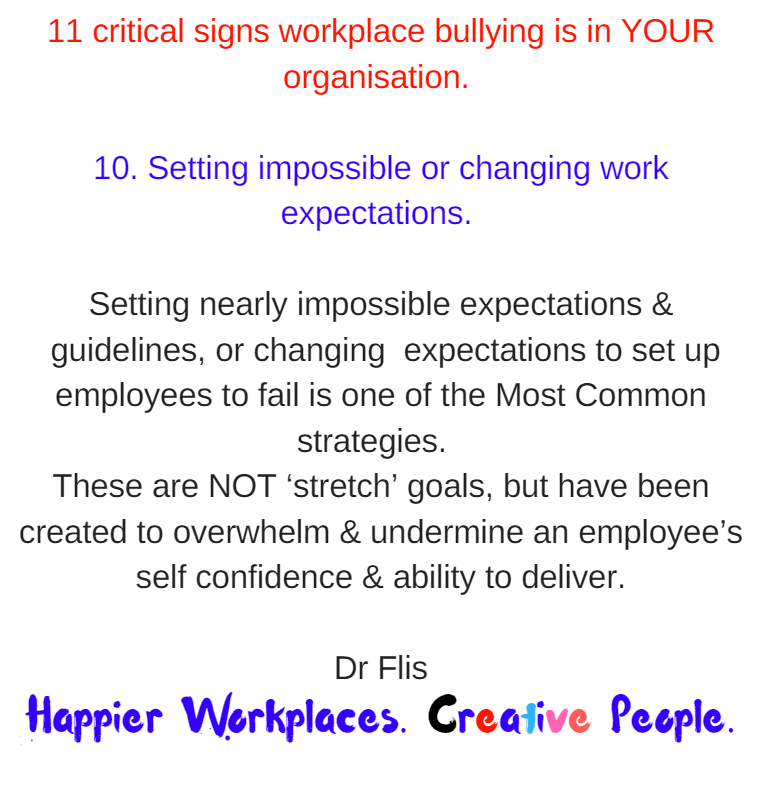 Next week I’ll be writing about recognising 20 warning signs online or offline bullying is occurring in your team or organisation. 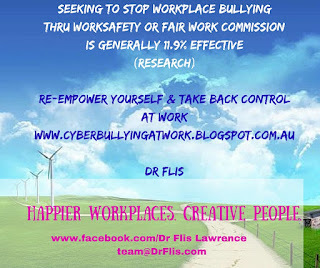 Can I stop workplace bullying & avoid being a target? Learn the effectiveness of 9 existing strategies, plus more. 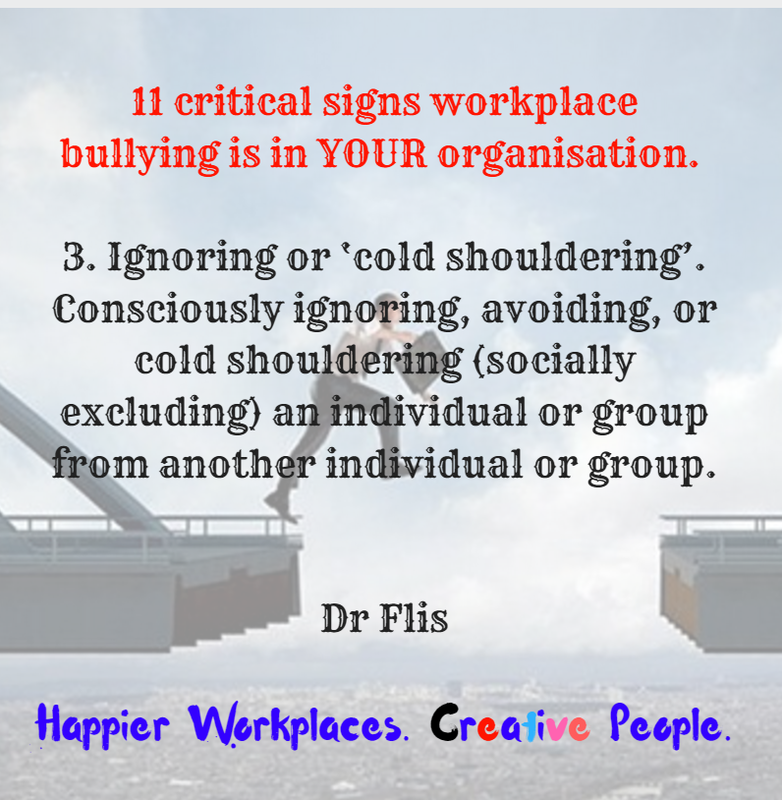 When talking about workplace bullying, research reports that most people generally attempt two or three of the following measures. 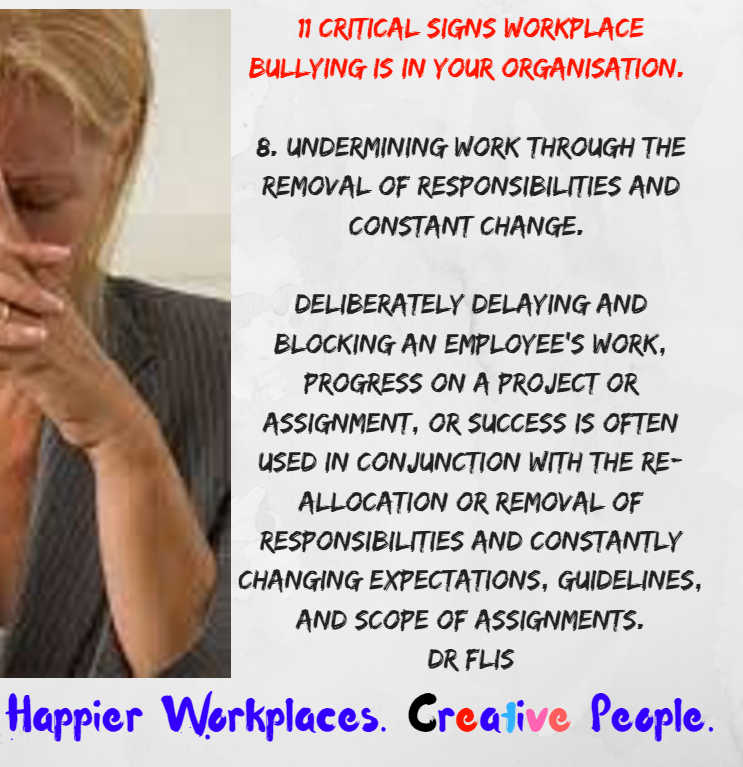 Some try to ignore it until it’s becomes critical and affects their work performance and/or health, and then report the matter to their OHS representative or HR area as a workplace behaviour in breach of the organisation’s respective OHS or anti-bullying/harassment policies. 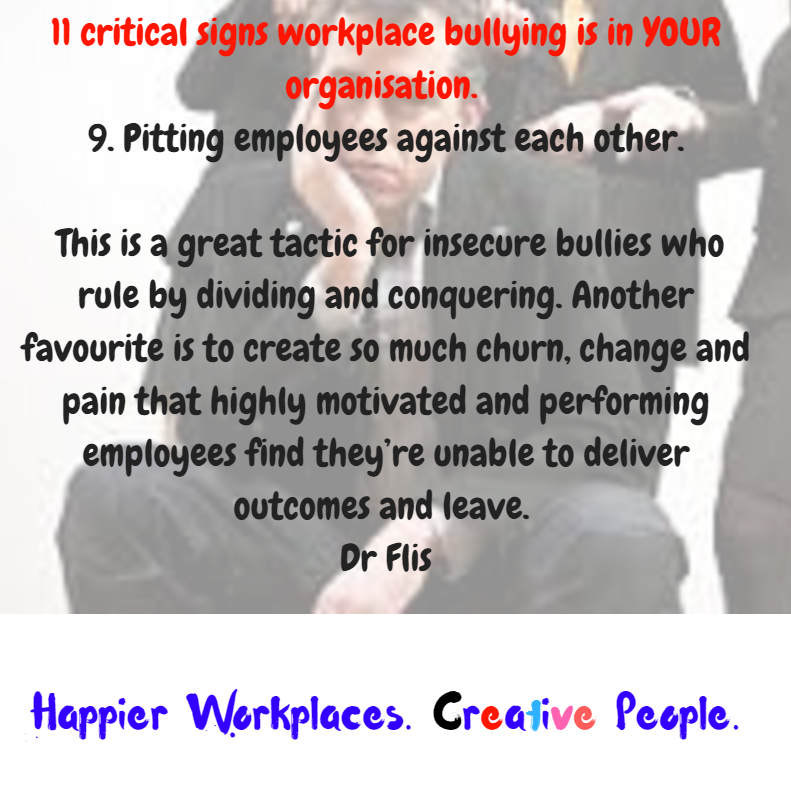 Depending on the target’s confidence levels, they may consider taking the matter to the bully’s boss, or asking HR to intervene on their behalf or through senior management. If they are a member, people sometimes seek assistance from their union. 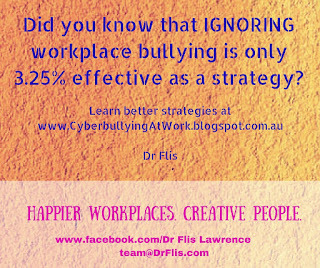 Research has found that a staggering 95% of targets are unlikely to obtain a workable resolution to the bullying using these strategies. **If you’re an OHS or HR manager searching for simple steps to assess your organisation’s culture, read my article ‘Why organisational culture is a Game Changer for workplace engagement’ or contact me at team@DrFlis.com for a free organisational culture assessment. Am I accidentally triggering the bullying behaviour? Most targets immediately assume it’s their fault, that they did something to precipitate the behaviour. One of the most powerful realisations is to know that you (the target) are not the problem – the problem is the perpetrator and the organisation’s culture that enables the behaviour. 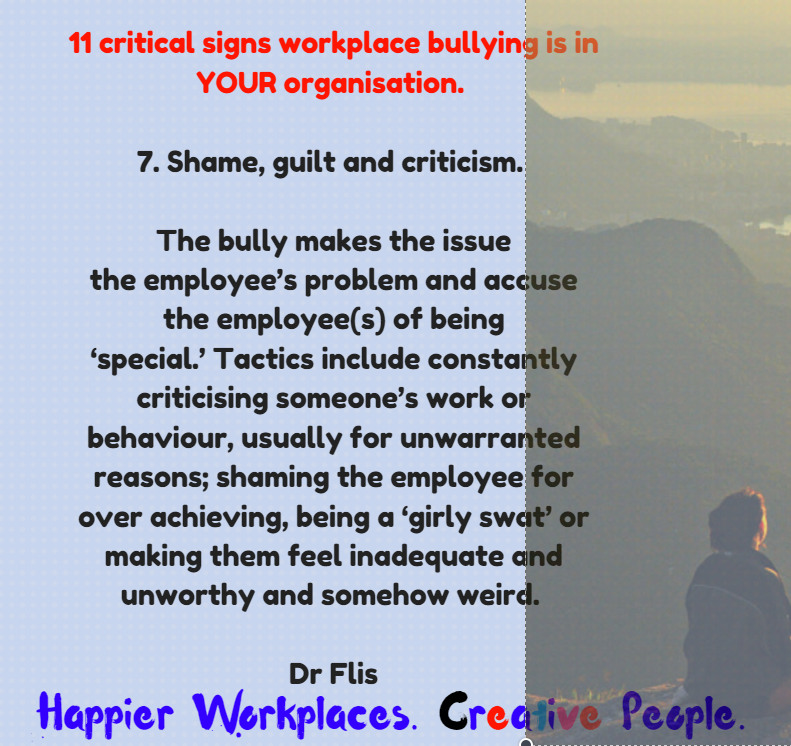 To put workplace bullying into context, you need to know that it is quite possible you may be triggering the workplace bullying. I’m sorry to have to tell you but you may have one or more of the following attributes. You are probably independent and may not be subservient to the perpetrator’s conscious or unconscious need to be seen and treated as special. You probably technically ‘out-skill’ the bully and consistently demonstrate greater emotional intelligence and social skills. You are generally liked and/or respected by staff, colleagues and bosses. 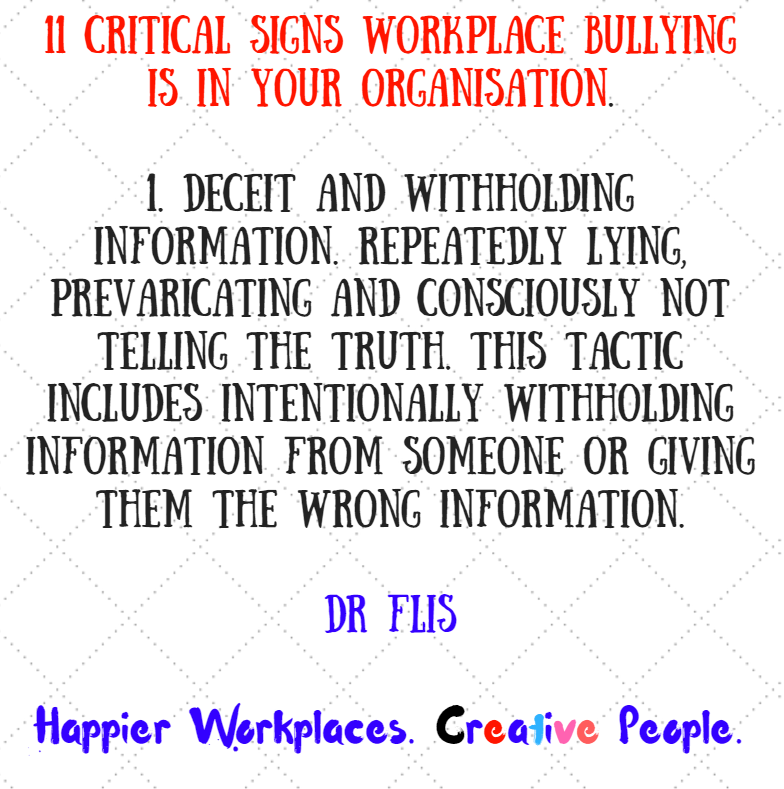 You may also exhibit the attributes of honesty and ethical behaviour, both of which threaten the bully, particularly if you work in an entitlement-based organisation that allows certain people to misuse their position to access favours (sexual or otherwise). Highly ethical people are also more likely to be whistleblowers, as they view fraudulent work practices are offensive. Unfortunately, if you are a whistleblower you are more likely to be bullied either by the perpetrator or their organisation. Interestingly, if you’re female then you may be at a higher risk of being bullied, by other women. 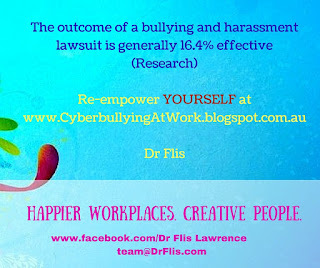 According to a 2010 Survey by the Workplace Bullying Institute, of the 35% of workers who reported observing or suffering workplace bullying, 58% of the targets were women. Women were also found to be 80% more likely to bully other women. 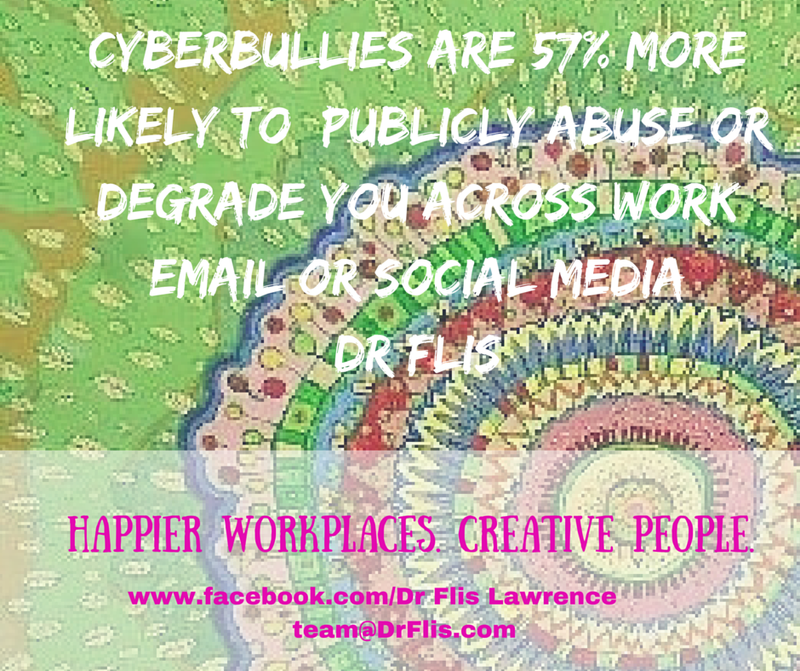 What does bullying look like at work? Put-downs, insults, excessive harsh criticism. So, I suppose you’re now wondering what you can do to stop the bullying? 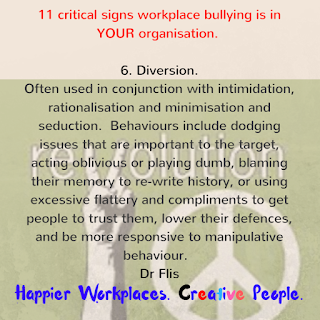 The Workplace Bullying Institute reports nine strategies traditionally used to stop workplace bullying. I have listed these in ranking of their effectiveness, and you can read the WBI’s full report here. 1. 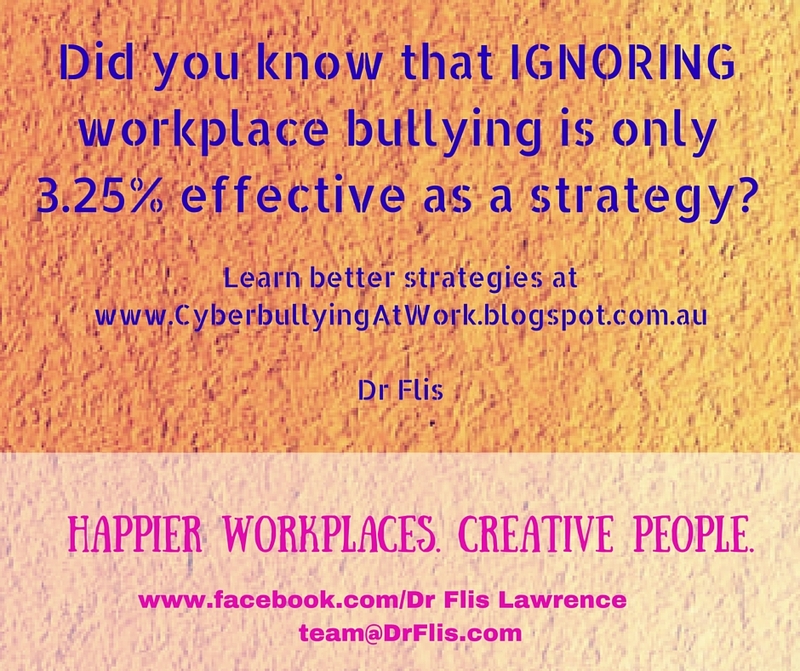 Ignore the behaviour | This strategy is 3.25% effective. 2. Directly confronted the perpetrator | This strategy is 3.57% effective. 3. 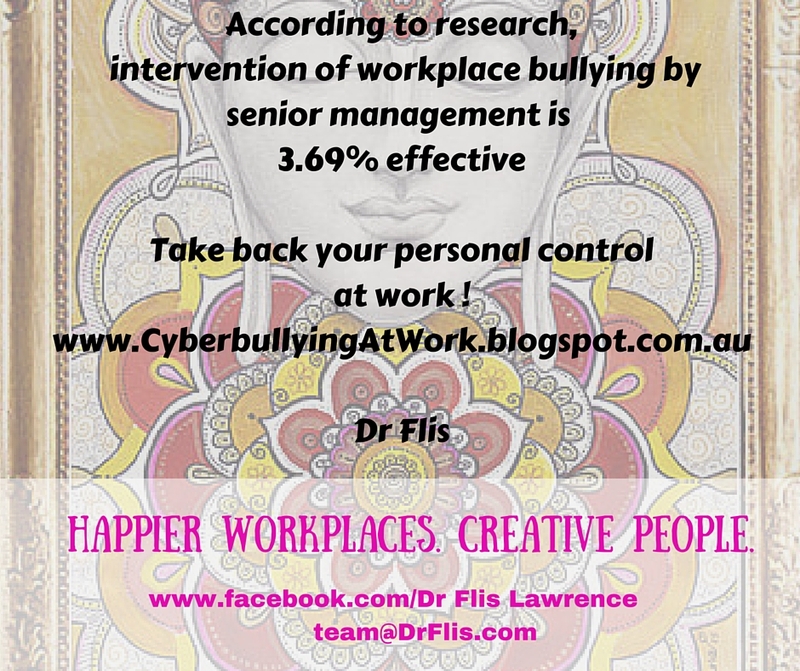 Requested boss/supervisor’s assistance to intervene | This strategy is 3.26% effective. 4. 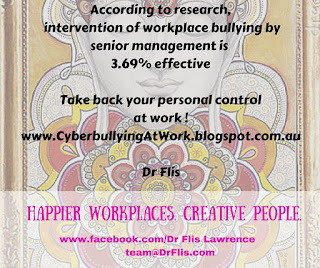 Requested intervention from senior management | Effectiveness | This strategy is 3.69% effective. 5. Requested union intervention | This strategy is 8.84% effective. 6. 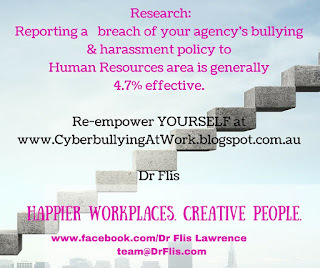 Raising an official complaint to HR regarding a violation of the bullying & harassment policy | This strategy is 4.7% effective. 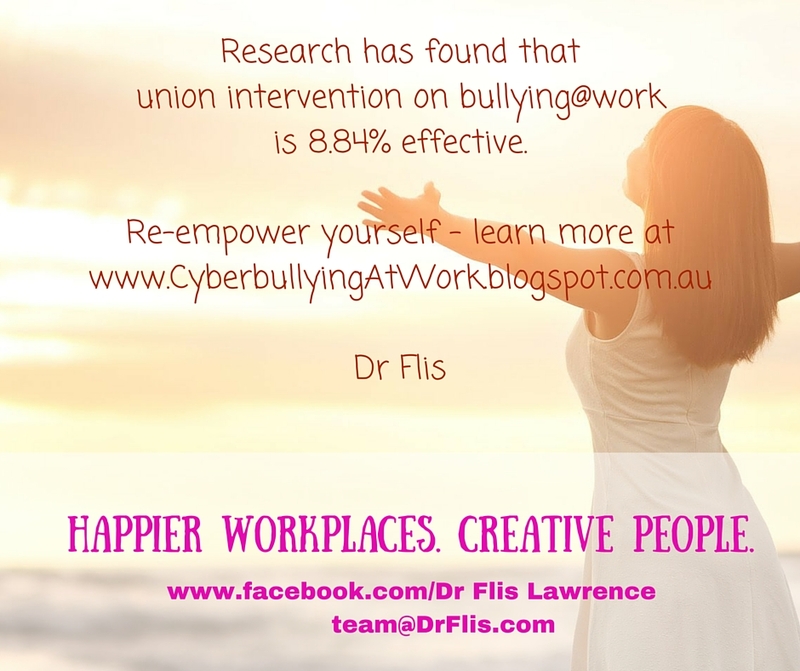 My view is that the only really effective way of preventing and intervening negative workplace behaviours is by taking back your personal power and control at work. 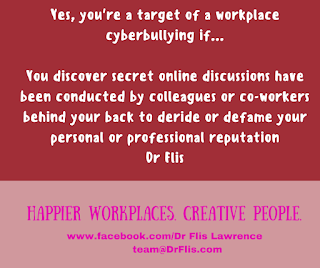 Next week I’ll be writing about how to tell if you’re accidentally enabling workplace bullying in your area, either as a co-worker, manager or employer. 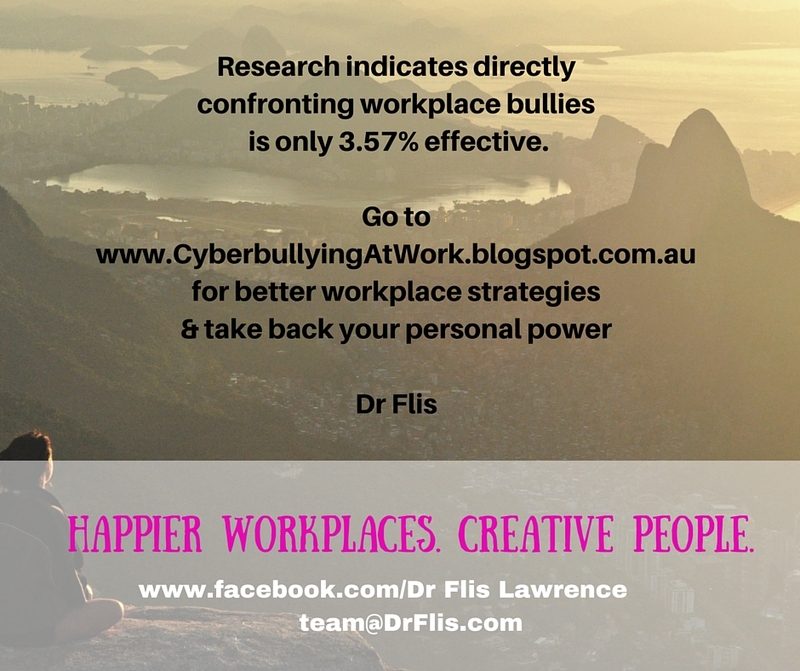 In week five I’ll be writing about a new strategy to stop workplace bullying, one that I’ve developed with the help of UK, US and Canadian researchers.